"One night, we just decided to try to make sherbet. It came out very delicious!" Mix sugar, milk, and lime juice together in a bowl. Mix in mashed strawberries. Beat egg white in a glass, metal, or ceramic bowl until stiff peaks form. Fold into the strawberry-lime mixture. Pour mixture into a freezer-safe container. Cover with plastic wrap. Freeze until almost firm, about 2 hours. Remove from freezer and stir thoroughly to break up chunks. Return to the freezer for 3 hours, stirring once every hour. Freeze until firm, 8 hours to overnight. 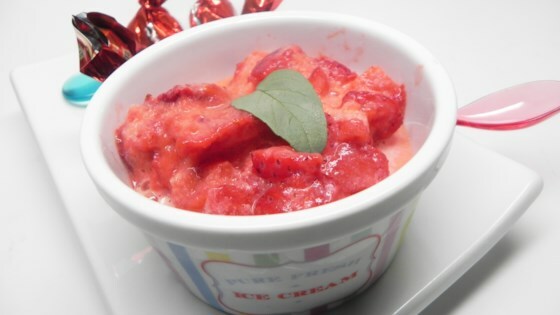 Turn fresh strawberries into an impressive and simple frozen dessert. If you don't have the milk, don't add it. We didn't add any milk and it came out fine, although the milk makes it way creamier.